Arlene Joan Green, 84 of Indio died peacefully with her daughter and grandson at her bedside November 25, 2018. She was born July 3, 1934 in Pomona, CA to Mortimer and Annabelle Callaway. Ms Green became a Yard Supervisor since February 11, 1971 then was promoted to an Instructional Aid on September 4, 1973. 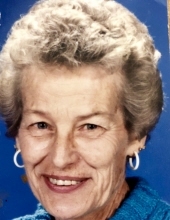 She worked for Desert Sands Unified School District for a total of 40 years. During that time she was an active representative of the CSEA union often helping those who didn’t understand their policy or guiding them with their unanswered questions. Arlene is survived by her ex-husband Kenneth Green, who she was married to for 33 years; daughter Julie Joan Green; and grandson Augustine ‘A.J.’; granddaughters Amanda, Alison and Mallory; and her older sister Laurabelle Ford, 86 of Pomona, CA. Ms. Green is predeceased by her son Gregory James Green who passed away at the age of 36. Services are pending and will be announced when they are finalized. To send flowers or a remembrance gift to the family of Arlene Joan Green, please visit our Tribute Store. "Email Address" would like to share the life celebration of Arlene Joan Green. Click on the "link" to go to share a favorite memory or leave a condolence message for the family.